A WOMAN has been rescued from a North Yorkshire river in a major operation involving the National Police Air Service helicopter and specialist rescue crews. 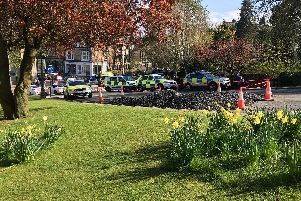 Police had been called shortly after 9am today to reports a person was in the River Swale in the village of Brompton-on-Swale near Richmond and their friend was looking for them. Fire crews, paramedics, the Yorkshire Ambulance Service Hazardous Area Response Team and the National Police Air Service helicopter were also sent to the scene at Brompton-on-Swale caravan park. At about 9.30am, a woman in her 20s was found near the river by firefighters. A spokesperson for North Yorkshire Police said: "The woman refused to cooperate and became aggressive towards emergency services and tried to re-enter the river but was rescued by fire and rescue officers. "The woman was detained under the Mental Capacity Act and taken to hospital by road ambulance. "A search of the river, which was low at the time, was carried out including assistance from the National Police Air Service helicopter. No-one else was found and officers are satisfied that no-one else was in the river."